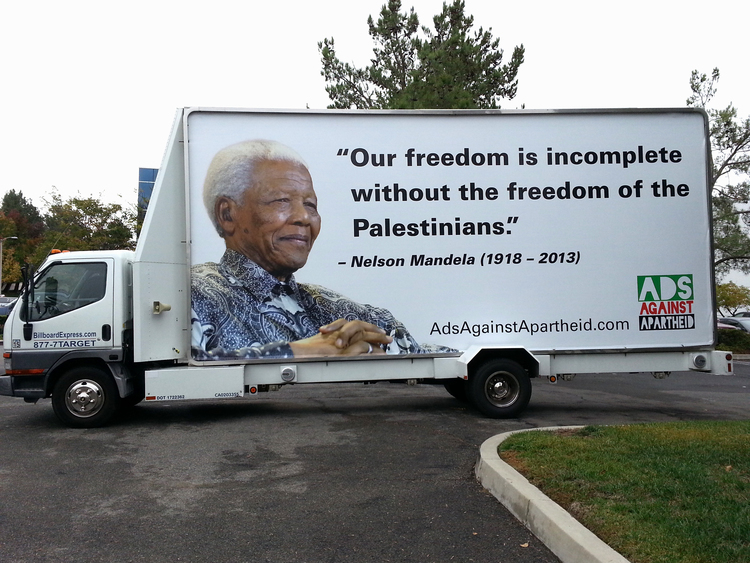 Ads Against Apartheid (AAA) has launched its first campaign in Los Angeles, California. It will run on more than 30 small billboards across the city over a period of two months. The ads, which highlight South African liberation leader Nelson Mandela’s powerful statement of solidarity with the Palestinian people, represent AAA’s first effort on the West Coast. This new campaign comes at a critical time in the region. Palestinians, particularly those in Jerusalem, are facing some of the worst repression in years. Excessive use of force by the Israeli police, rapidly increasing settler violence, and restrictions on access to the Haram Al-Sharif (Temple Mount) have lead Palestinian communities all over Israel/Palestine to protest, and in a few tragic instances, to commit acts of violence. Palestinians residents of Jerusalem live under a different set of laws from their Jewish counterparts. They are forbidden from voting in national elections, and their residency status – and with it their right to live in Israel/Palestine – may be revoked if the government discovers that they maintain a residence elsewhere. The Jerusalem municipality also assigns the city’s highest tax rate, usually reserved for the wealthiest residents, to predominantly Palestinian neighborhoods while leaving them drastically underserved.